Cel-Fi PRO is an OFCOM approved simple mobile phone signal booster that strengthens your 3G and 4G signal coverage indoors. Cel-Fi can create a large coverage bubble (up to 40 metres) which automatically adjusts to the size of the indoor environment served  making it ideal for multi-story homes and medium sized businesses. It also increases Radio Frequency (RF) network capacity for mobile operators, eliminating the possibility of interferences to the mobile operators spectrum whilst allowing support for up to 20 devices simultaneously. SEE OUR FREQUENTLY ASKED QUESTIONS SECTION BELOW FOR USEFUL INFORMATION. The CelFi PRO can be set to boost any UK network. The network to be boosted is selected using the "Wave" App for Apple or Android Smartphones. You can change the network being boosted at anytime using the App, however, the product can only boost one network at a time. We can initially set the network for you prior to dispatch or you can choose to set this yourself upon delivery, using the app. How it works:- Poor reception of wireless signals indoors can be affected by several factors. These include buildings, trees, natural obstacles and the distance from the network tower. Cel-Fi is an innovative solution that improves indoor coverage by capturing the weak signal that reaches the building, improving it and retransmitting the signal indoors via the Coverage Unit. Multi-core Processor  runs advanced digital echo cancellation and channel select filtering algorithm. Complex smart antenna technology  maximises system gain and provides improved coverage and signal quality. Sophisticated intelligent software algorithms - Cel-Fi incorporates sophisticated Self Organising Algorithms which consistently and intelligently alter their status to maximise real-time coverage and adjust to the size of the indoor environment served. Self-adjusting technology  built-in chip automatically selects the correct frequencies for your carrier. With a patented 5GHz wireless link between the two units, high quality data and voice transmissions are secure and almost instantaneous. The signal booster provides security to networks by eliminating the possibility of interferences for the network provider. The Cel-Fi PRO has intelligent antennas built in to the units, and an external antenna port that allows for connection to an aerial (additional aerial cable not included). The multi-directional technology seeks to find the best signal and adjust to it accordingly. Installing this indoor mobile phone signal booster requires no technical knowhow, there are no complex manuals to read. It's as simple as plug-in and play. 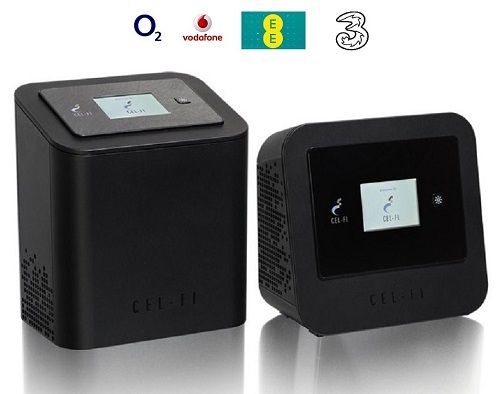 Cel-Fi PRO consists of two units: the Network Unit (NU) and the Coverage Unit (CU). The NU sits near a window or in an area of the building that has the strongest signal from your network provider. The CU is then placed in the centre of the home or where the signal is used most. Faster downloads:- Get more from your smartphone with faster downloads, smoother streaming and improved voice coverage. Extends your battery life:- When your phone isnt using battery to search for signal, it can save battery life for the fun stuff like downloading, making calls and taking pictures and videos. IntelliBoost© - Cel-Fi systems are powered by IntelliBoost©, two custom-designed core processors that specifically work to optimise indoor reception for both 3G and 4G in real-time. It provides intelligence to the Cel-Fi system and automatically adjusts itself to ensure you are always getting the best coverage. Q. Will it improve Voice and Data coverage? Q. If it doesn't work can I return it. A. Yes you have 14 days to return the product if you are not satisfied. You must return the item with it's original packaging. Q. How do I choose/change which network I want to be boosted? A. There is a free App (Celi-fi WAVE) for Apple or Android Phones, when you lanuch the App near your Celfi Booster it will search for it and then present you with a menu to choose your preferred network. Scroll down this page for links to the Apps. Q. Can I change network? A. Yes you can change network as often as you like using the App..
Q. Can I boost more than one network at a time? A. No. It only boosts the network you select. Although each unit boosts one network at a time, you can install multiple units in the same building to cover more networks. Q. I don't use EE, Vodafone, O2 or THREE I use a network like Sky Mobile, LycaMobile, GIFFGAFF, Tesco Mobile, BT Mobile, Virgin Mobile etc. Will it work? A. No Problem. There are many mobile operators who 'Piggy Back' on one of the major four networks. Sky Mobile use O2 network, BT Mobile use EE. You simply set your Celfi PRO to boost the parent network and all the Piggy Back networks also get boosted too. Scroll down for a full list of Mobile Operators and who they Piggy Back on. Q. Why is there a drop down box to choose a network when I order? A. Some customers prefer the unit to be ready to work out of the box, (Plug and Play) so we can set the unit to a network before dispatch or you can do that yourself when it arrives. Either choice will not affect dispatch time/next day delivery service..
A. Yes. The SAR impact is comparable to that of a smartphone, making them equally harmless to human health and the environment. Q. I get signal outdoors but not indoors. Will it work? A. The unit needs some 'donor' signal to be able to boost it. If you can only get signal outdoors then there are optional external antennas to maximize the performance. The product has a Network Unit and Coverage Unit, the NU has a SMA type connector for an optional external antenna. Please look for the OSCAR40 antenna which is most commonly paired with this product when an external antenna is needed.